In the third step of Natta Adavu, you will be introduced to a new leg movement where we cross our legs one behind the other. 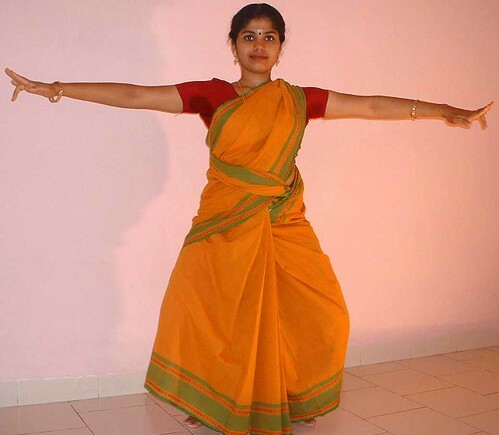 Be in Ardhamandala posture with hands stretched apart and palms in Tripataka facing down as shown in this image. 4. Now bring the right leg which is behind and stretch it in Alidha. The right hand is stretched with Tripataka gesture facing up. Note that the left hand continues to be in Tripataka facing down. Say “tai hi“. 5. Finally, bring back your right leg in Ardhamandala with a tap and the right hand Tripataka is truned to face down. Note that the left hand continues to be in Tripataka facing down. Say “ya ha“. This completes one count for the Natta Adavu third step. One count involves three repetitions (sets) of “tai yum tat ta tai hi ya ha”. Thanks for your patience. I know it is getting tougher with just the description 🙂 So I shall post video on the Natta Adavu also soon. @Aruna, the last picture is for the sixth count, where you have to cross and tap. Am not sure if you are still updating this site. I find it very useful. Am afraid I can’t find any of the videos of the Natta Adavu. Am I looking in the wrong place? I look for them at the end of the explanation on how to do the step. Please let me know.